[AUTO]:[Choose a card from your hand, and discard it] When your drive check reveals this card, you may pay the cost. If you do, choose one of your units with “Raindear” in its card name, and it gets [Power]+5000/[Critical]+1 until end of turn. 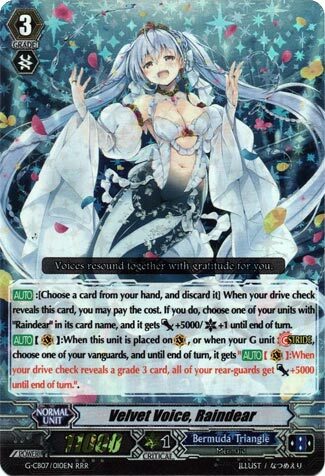 [AUTO](VC):When this unit is placed on (VC), or when your G unit Stride, choose one of your vanguards, and until end of turn, it gets “[AUTO](VC):When your drive check reveals a grade 3 card, all of your rear-guards get [Power]+5000 until end of turn.”. No multi-attacking here, but that’s what your rear-guard support is for. This card’s main saving grace is that there are so many cards in Raindear decks that can be treated as Grade 3 that this has a reasonably likely chance to go off. Interesting mind game to play on people is her numbers game: she powers up her own booster mid-battle, so even if the opponent 2-to-passes you, as long as you score one Grade 3 or pseudo Grade 3 plus a trigger, you’ll break through. The first ability treating all copies of herself as a Critical Trigger for a -1 is pretty baller for sudden damage. Also probably one of the better partners to Meggido. Columns are appreciated. What’s up, Rogue Squad?! Personally, as you may know by now, I’m not exactly a fan of the Bermuda Triangle, however, if there was one archetype I found interesting, it’s Raindear as she was one of the first units in the game to get a solid bonus by drive checking a Grade 3, and it looks like Bushi took that concept, gave it to Raindear and amplified the hell out of it, and that’s including this newer Raindear. I love how this card, essentially, becomes a Critical Trigger when it’s checked, and not to mention that its on Stride skill gives all rear-guards +5k whenever you check a Grade 3, which is a nice touch seeing how it doesn’t make Grade 3’s a dead check anymore. Not to mention that since it’s not restricted to just Raindear G Units, even something as extreme as Meggido becomes a major threat as the powered up units become even more powered up. Not to mention the different Raindear support units that become Grade 3’s makes this an overall solid card for this archetype. Next Time: We had a Ruby get better (Garnet, yes, but roll with it), we’ve seen a Sapphire improve…let’s finish this trilogy, shall we? Previous articleDid Link Monsters Make People Quit Yugioh?